Tofutti has been making some of the best dairy-free foods for many years, including this delicious spreadable vegan cream cheese. 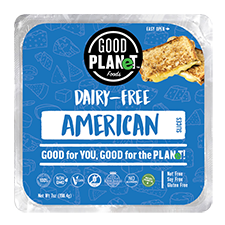 Perfect for smearing on a bagel, using in dips, or, use in place of cream cheese in any of your recipes for a spot-on alternative to dairy cheese and Kosher. 8 oz. (227g) container is $4.49. From Randi Wininger of French Lick, Indiana on 12/25/2017 . I wanted to make dirt pudding but it required cream cheese. I got this and wow. It is so creamy and smooth. I can't comment on the exact taste since it was mixed in with other stuff. But I got no weird after taste like with some vegan cheeses. I will definitley be ordering again and looking into more recipes that call for cream cheese! From Anonymous of Stoneham, Massachusetts on 2/12/2017 . When I first tried it for a while I couldn't get used to the taste. I tried it again months later and I loved it. I have it every morning on a bagel. Even my pets love it. I highly recommend trying it again if you didn't like it at first. From Anonymous of El Paso, Texas on 9/20/2016 . This tastes very good, almost similar to cream cheese, however it has a slight (extremely slight) weird after taste and the health content in this is yikes! But it still tastes great, highly recommend if you have a cream cheese craving! From Clark Morrison of Washington, District of Columbia on 1/23/2016 . Alright, you delusional fellow vegans. This tastes like freaking paper pulp. Ok the texture is spot on like dairy creame cheese but the flavour is deplorable. I was so upset! It tastes like wet sad paper. I don't know why you would buy this!? I would rather go without creamed cheese than even ever try this stuff. Why would you buy this?! Don't. Don't do it. You'll be angry and still hungry. This is so sad. Y'all are delusional if you give it more than a star review. Why? BC it's a one star ewwwwwww! From Marjorie Darby of Toronto, Ontario on 3/16/2013 . I admit I'm not the biggest fan of this stuff, but love that I have the option, both plain and in recipes. 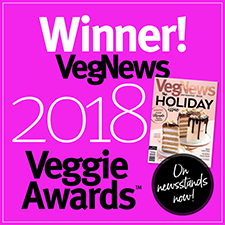 I am vegan, and my husband will usually assume he's not going to like vegan products. 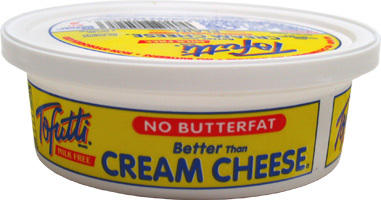 This Tofutti 'Better Than Cream Cheese' is something I buy only occasionally. Recently, I included it with my grocery delivery order, and put some on a toasted bagel, with a tea, for my husband, as he ran out the door for work. When he came home, he said, "That was one of the best bagels I've ever had!" "Really,"I replied, incredulously, scanning for sarcasm. "No, really," he assured me. That's when I told him I'd expected the complete opposite reaction, since I'd made it with vegan cream cheese. He was floored. "Well, then that's an extra-nice surprise," he remarked. So, I (the vegan) thinks it's fine, while the committed non-vegan thought it was excellent (thought it was cream cheese). Go figure!